The program teaches culinary job skills to unemployed and underemployed Rhode Islanders. Students Rebekah Weeden and Jessenia Guerrero peel potatoes in the Rhode Island Food Bank Community Kitchen. Photograph by James Jones. Jade Cote-Clarke stands before an audience of eleven students and an instructor in a classroom with a sock puppet on her hand. She’s wearing a crisp white chef’s coat, black apron and hat, and the button-eyed sock greets the class with a miniature white chef’s hat on its head, moving its mouth with the help of her hand. She’s pantomiming a lesson about foodborne illnesses caused by bacteria. Cote-Clarke is participating in the Rhode Island Community Food Bank’s fourteen-week Community Kitchen program, a free, unpaid culinary job training program that prepares twelve or thirteen low-income adults during each session for careers in the food industry. The program is supported by grants, corporate gifts and donations from individuals. Some students have never had any kitchen experience. Two chefs, Heather Langlois and Ron Lewis, guide them in commercial cooking basics, as well as what it means to be a good employee, Monday through Friday from 9 a.m. to 4 p.m. The program is an investment in their future employment, and many of the students work other jobs on nights and weekends to make ends meet while they participate. A sign on the wall behind Cote-Clarke reads: “15 minutes early is on time; on time is late.” No cell phones are allowed in class, and when a guest enters the classroom, each and every student stands up, greets the guest by name and introduces themselves with a hello and a handshake. Cote-Clarke’s puppet is part of an assignment for which students create a model of a foodborne illness to prepare for the ServSafe certification test. During the lesson, she teaches students where the bacteria can be found and how to prevent it from spreading. “Don’t make me sick!” says Community Kitchen student Nahami King to the puppet. King is from Providence and the mother of two boys, a six year old and a thirteen year old. She took a six-year break from the workforce to raise her children. Now that her second son is heading to kindergarten in the fall, she’s using this program as an opportunity to regain her confidence before going back to work. She hopes to one day run her own farm-style dinners, and to gain experience, she’s interning Saturdays at the Salted Slate restaurant in Providence as part of the program. King is an avid home cook who likes to garden and shop for produce at local farms when she can. “I have never worked in a restaurant, or had any restaurant job,” King says. “I had eaten at Salted Slate once or twice for a special brunch, and the food was delicious. I was like, ‘I want to cook like this!’ I was the first one to go there. I said to chef Ben, ‘I really want you to teach me how to make delicious food like this. Can you have me please?’ ” She convinced the chef, Ben Lloyd, to teach her how to cook like him. After the puppet presentation, Cote-Clarke, who is head chef for the day, divides up students’ duties for kitchen work. Some will make sandwiches, while another prepares baby carrots; some will steam green beans, while others will make fish sticks, biscuits and carrot cake. Each student has a job, and they must work together as a team to create meals for eighty children, which will be delivered to afterschool programs at the Boys and Girls Club in East Providence and the West End Community Center. Heather Langlois, a graduate of Johnson and Wales University’s School of Culinary Arts, helped start the Community Kitchen program in 1998. She’s been serving as a mentor to students ever since. 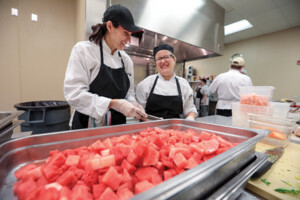 More than 500 individuals have completed the Community Kitchen program over two decades. The graduation rate is 80 percent, and many have gone on to work in restaurants, corporate cafeterias and nursing homes, or have chosen different paths at nonprofits working in social services to give back. As part of the program, students master basic cooking skills, food service operations, kitchen safety and first aid, but another important part of it involves learning life skills and career readiness. After seven weeks, students are assigned an internship at an on-the-job training site, where they gain real world experience in a kitchen. Some have internships at Dave’s Marketplace, Public Kitchen and Bar at the Renaissance Hotel, the Capital Grille, Wildflour Vegan Bakery, Yoleni’s and many more, just like King at Salted Slate. Nick DeCamp graduated from the Community Kitchen program in 2015 and went on to help run a similar established culinary education program at Amos House, a social service agency in Rhode Island. Amos House manages the largest soup kitchen in the state, provides services to more than 15,000 people a year and houses nearly 165 men, women and children a night. DeCamp often goes into the Community Kitchen classroom to speak to students about how the program helped change his life. He had to leave his job of twenty years as an elementary school teacher in Providence on disability, as he suffered from major anxiety and depression. He says he basically sat on the couch for four years in his mid-forties because he felt worthless and unable to support his wife and four children. “The only thing I knew how to do was teach and I couldn’t do that anymore, so I had no idea where I was going to go from there,” says DeCamp, who is now fifty. His wife eventually told him about the Community Kitchen program since he liked to cook at home, and he finally decided to apply and got accepted. “When I talk to the Food Bank, I tell them that they really saved my life because I was at the end of my rope in 2015 and it’s been a complete turnaround,” DeCamp says. After completing the program, he got a job as a culinary instructor for Cookie Place food service training program and, two years later, seized the opportunity to take on the position as chef instructor for the Amos Culinary Education program at Amos House. Deborah Irlanda with Jade Cote-Clarke (right), interned at Wildflour Vegan Bakery in Providence while enrolled at the Community Kitchen. Photograph by James Jones. Back in the classroom, the students are all dressed in their chefs’ whites, ready to head into the kitchen for the next part of the day. Before they are allowed to enter, they each must present a mise en place checklist to Cote-Clarke to make sure they are prepared. The checklist includes all the items they need for the day, as well as marked tasks like “bath and deodorant,” “brush teeth or mint,” “no jewelry,” “clean hands” and “clean hair up in a hairnet and hat.” She greets the students at the swinging doors for inspection. “No gum. No sick?” she says to each student, and they hand her their checklist before pushing through the doors. The program means a lot to Cote-Clarke, as a young adult struggling to find a job. 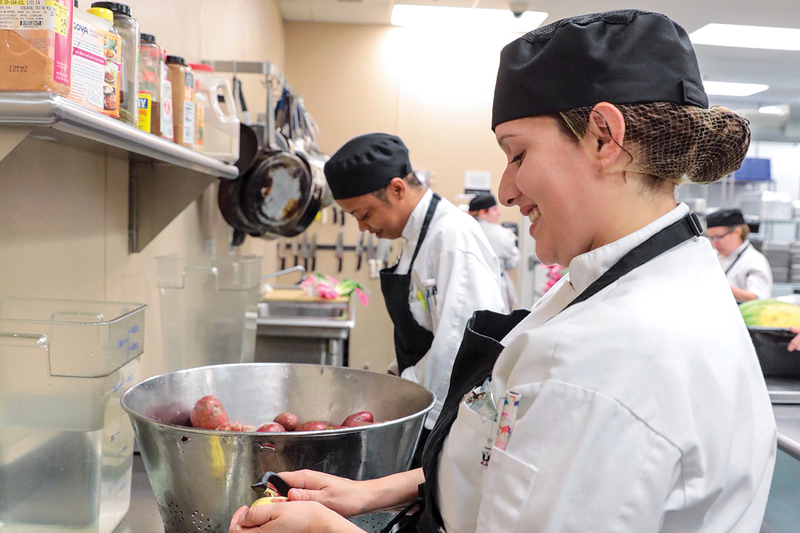 Community Kitchen has taught her professionalism and given her confidence. “When I joined, I felt really nervous, but after a couple weeks passed by, I was happy and let go and I had a very good time,” she says, adding that she is doing her internship at the Friendly Home nursing home in Woonsocket. Right now she’s observing Deborah Irlanda wearing rubber gloves as she makes sandwiches in assembly-like style. About sixty slices of bread are lined up on a plastic wrap-lined counter, while Irlanda and a few other students lay slices of ham and cheese on top. “It’s a simple task, but more fast-paced,” says Irlanda, who came to Rhode Island from Puerto Rico in February, about five months after Hurricane Maria ravaged her home city of San Juan, leaving her home still standing but her belongings devastated. She was without power for two months. At the same time, she had been going through a divorce after twenty years of marriage and she had lost her job. While in Puerto Rico, she applied for other jobs but got discouraged when nothing ever worked out. Before the hurricane, she became depressed and didn’t want to leave her house. The one thing that kept her going was cooking. She’d send her adult daughter out to shop for ingredients and bring them back to her kitchen, so she didn’t have to go to the store herself. “I love cooking and that was the thing that saved me during that period,” Irlanda says. After the hurricane destroyed Irlanda’s neighborhood, her daughter showed her an online advertisement for the Community Kitchen program in Providence. The opportunity had interested Irlanda, but she dismissed it, thinking there was no way she could get from Puerto Rico to Rhode Island. When she coincidentally found out a friend lived in Rhode Island — not New York, as she had always thought — she applied for the program in December 2017. Meanwhile, her daughter was accepted into Cornell University’s biomedical engineering master’s program, but chose to defer her attendance for another year. Irlanda was called for an interview at the Community Kitchen in February. She made arrangements to come to Rhode Island and stay with her friend, who happened to live only five minutes away from the Food Bank. Irlanda was accepted to the program after a day visit, but learned she couldn’t officially start until April. She considered going back to Puerto Rico during the lull, but ended up getting a part-time job cleaning for Aramark while she waited and moved in with her friend for the first month. It hasn’t been easy since she’s arrived here. She’s moved to four different places; currently, she’s living with another Community Kitchen classmate. But it’s all been worth it, she says. She gained experience at her internship at Wildflour Vegan Bakery and Juice Bar, which was fitting for her since she is a vegetarian who also likes to eat vegan. She worked alongside another Community Kitchen graduate who is employed there, creating vegan desserts. She learned baking is not the right fit for her, and recently accepted a job as a line cook at Yoleni’s Greek restaurant in Providence.